Mixed Roses in a Round White Box. 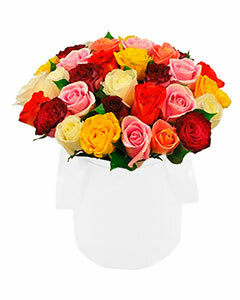 A beautiful 24 Mixed Roses in a round white elegant gift box. Perfect for Birthdays, anniversaries, Valentine's, Mother's day, new born baby girl celebration, graduation, get well and many more. Please note that due to stock availability the flower round gift box, vase or basket might slightly differ from the one in the image. However, the same color / look of equal or higher value will only be used.